Pranklopedia is the aspiring young prankster’s dream-come-true. It shows kids aged 7-12 how to do more than 70 pranks, from classics like short-sheeting a bed to the newly invented squirting blister trick (yuck!). 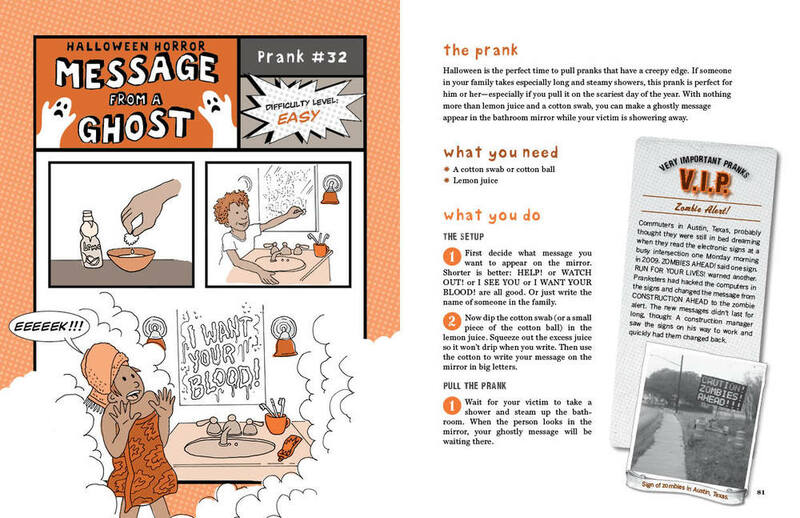 There are also tips on how to pull the perfect prank and what to do when a prank backfires, and profiles of the greatest pranksters in history. 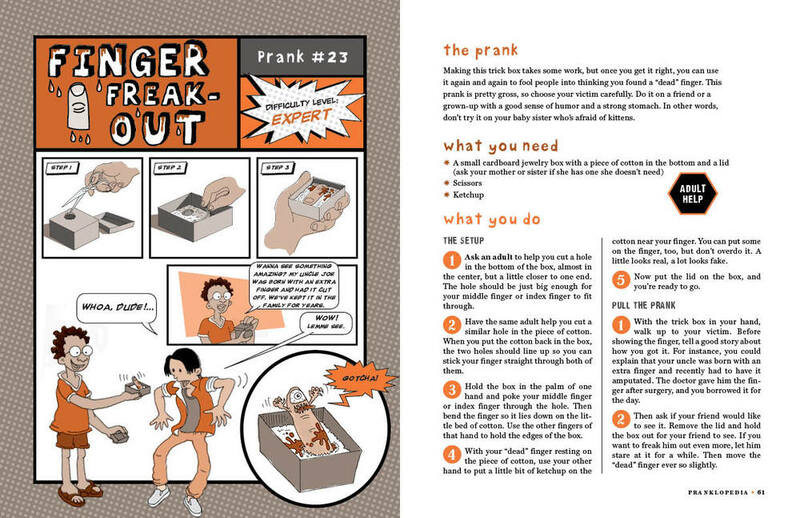 Kids also get 20 pages of colorful pranks they can cut out and use on their friends. There are even some pranks on the reader, so watch out! Watch pranks from the book in action! Get a free taste of Pranklopedia or click below. Feeling daring? Check out even more pranks. To arrange a Pranklopedia author visit to your school, library, or bookstore, click here. What’s the first prank you ever pulled? If you don’t count being born, it was the classic salt-and-sugar switch. I pulled this prank on my father at breakfast one April Fools’ Day when I was about six years old. I remember watching with a mixture of delight and trepidation as he stirred two spoonfuls of salt into his tea, took a sip, screwed up his face in disgust and spit it out. He didn’t think it was funny, but I enjoyed the show. Have you ever had a prank backfire? Yes. The worst one was a prank I pulled on my father (again) when I was in my twenties. I had just moved to New York City and was broke. He gave me money to go see some dance performances. After one of the performances, I decided to thank him in an unorthodox way. I typed up a letter that appeared to be from the director of the dance company. In the letter, I had the director explain that he had talked to me after the show and wanted to personally thank my father for supporting the arts by funding my trips to see dance. Unfortunately, at that time my father was working for an organization that ran an awards program for young artists and he was seeking judges for the dance component. He wrote to the director and invited him to serve on the judging panel. He was completely mortified—and livid—when I told him the letter he had received was a fake. 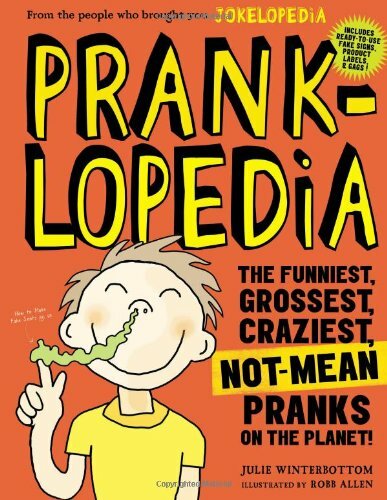 Did you test out the pranks in Pranklopedia? Yes. Except for the classic pranks that I had already pulled many times, I tested the rest of the pranks on my boyfriend over the course of a year. I don’t think he enjoyed it, but his feedback was very helpful. Once in a while, he would miss the prank completely, and I’d have to figure out if there was something wrong with him…or with the prank. Photos: Images on soup can label: fotolia: fotomaster; OlegD; product shot: Netta Rabin. 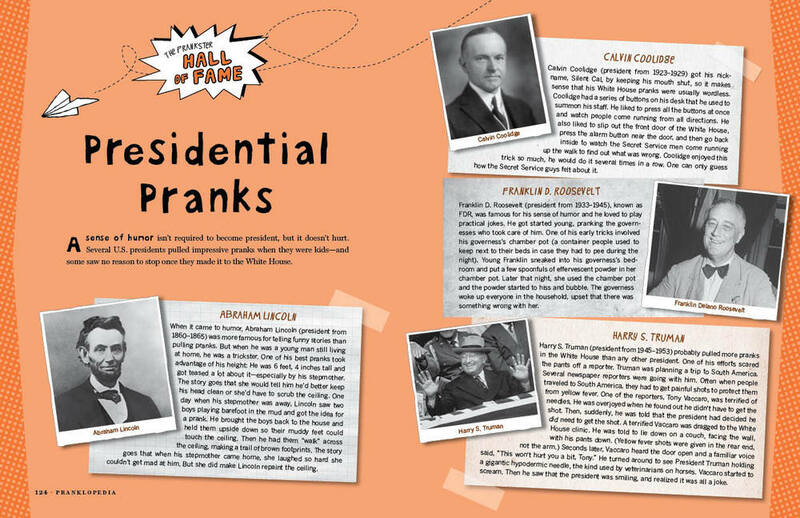 Presidential Pranks: Lawrence Thornton, page 124; Getty Images: Hulton Archive, page 125 top; George Skaddling/Time Life Pictures, page 125 middle; Time Life Pictures, page 125 bottom.